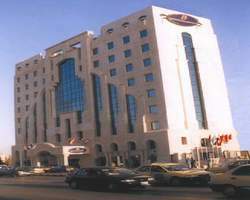 Dana Plaza Hotel is Ideally located in the heart of the capital’s business and shopping district, just 25 minutes from Queen Alia International Airport. Air Conditioning / Central Heating. Electric Current 220 V ~ 240 V Cycles-50. All day dinning resturants, providing a wide variety of cuisine, served buffet style. An A La Carte snake menu is available at the terrace all day long. Hubbly bubbly is available. An elegant lobby cafe that is the ideal place for an afternoon tea. An outdoor resturant that provides a wide range of light meals complimented. The pool deck is located at the highest point in west Amman with a breathtaking view of the city. Good food, great drinks, fabulous sky and flavored hubbly bubbly. All in one package at the Checkered Terrace. Video & T.V ( Multi System ). The life Lounge Health Club is Equipped with the atest High performanc exercise machines and personal gym instructors.